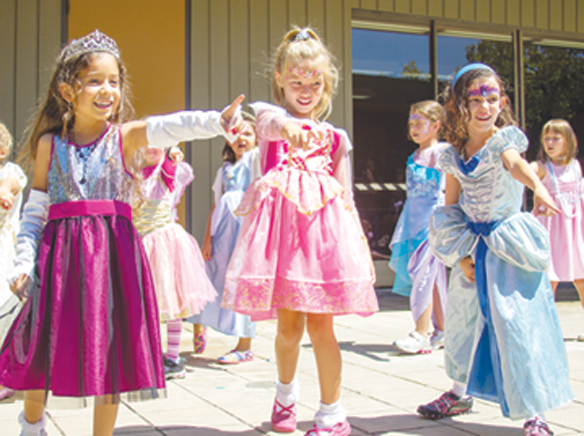 El Cajon’s recreation department rolled out the red carpet for young royalty at the second annual Living a Fairy Tale youth camp held at the Hillside Community Center in El Cajon. Boys and girls ages 5 to 10 adventured in to a land of monarchs, mythical creatures, and fun. Campers danced with delight and sang with soul. Princesses and princes pampered themselves with hand-made bath salts, lip-glosses and lotions and made their very own fairy wings. Dragons and elves created their own fairy tales complete with illustrations to share with parents when their journeys came to an end. Glenice Stainbrook, recreation services supervisor for the city of El Cajon, said she was impressed with the imaginative work done by her campers. The week long camp ended with a special celebration. Friends and families gathered for the “Fairy tale Tea Time” complete with tea party treats made by the campers. Moms and dads, brothers and sisters, aunt and uncles, grandmas and grandpas all gathered around the courtyard to watch their young princes, princesses and dragon and elf-children read their personal fairy tales out loud and a special dance performance they practiced throughout the week. Camp Counselors Katy Chapman, Brittany Shepman, Alysha Robinson and Marissa Hernandez all said the kids worked their tiny tiaras off with great success. Stainbrook said along with the “Living a Fairy Tale” camp El Cajon’s Recreation department has an extensive suite of programs for the kids of El Cajon designed to promote social growth, expression and creativity in a positive environment.